When I first visited Las Vegas, by myself in the mid 80s, I felt that the place was wrong to be there in the middle of the desert. It felt so artificial and unreal. It still is, but this time the contrast was interesting and I enjoyed walking along the strip, taking in the iconic hotel casinos and having a go at roulette in the Bellagio. There a friendly croupier patiently explained the intricacies of betting and as a result our $50 stake lasted an hour before we lost it. You know the saying, "What happens in Vegas, stays in Vegas", well, mainly what stays in Vegas is - your money. As imparted by a Vegas show MC, there's a reason why the hotel casinos are as luxurious and large as they are; and why you live in a little house in the suburbs of some city. Breaking a personal rule we bought theatre tickets from a street seller, which did however turn out to be good value - a variety show in the V Theatre inside Planet Hollywood / Miracle Mile and a dinner for us both all for $40! Although not a big show with celebrity head-liners, the show was very slick and entertaining. Not sure about the free wine that we got, but the dinner afterwards was very good. 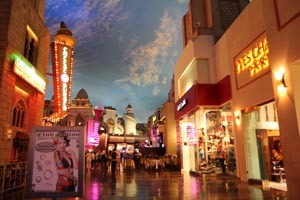 Miracle Mile starts out as a normal indoor shopping centre, but the entertainment area of theatre and restaurants has dusk like lighting and a twilight sky projected on the ceiling so that eerily you feel as though you're outside! The show was good fun and a nice introduction to Vegas for us. Walking back along the Strip at night was also entertaining, a free show of the Bellagio fountains, lots of interesting groups of people, yet all felt safe and a good party atmosphere. I don't doubt there is a darker side to Vegas, but we didn't see it and came away with a positive impression of the place.